I’d like to give you the lowdown on the blue potatoes before I get into our CSA boxes this week. We tried to grow Adirondack Blue potatoes last year, with very bad results. In fact, all of our potatoes last year did horrible as they were all stricken with late blight. This year I got a different seed source, and moved the potatoes to a different location. They were planted with a slightly different method of hilling, and so far so good. I only planted a few All Blues, though, so there won’t be a huge amount of blues. Not being sure if they are good performers, I didn’t want to chance not getting any potatoes. In fact, you will see 7 different varieties of potatoes this year because I don’t like throwing all of my eggs in one basket. I figure if I have at least one good variety, I won’t be left without potatoes ever again. Potatoes are such a versatile food! Casseroles, salads, baked whole, fried and in soups these guys top my list of comfort food. Be the coolest at your Independence Day Picnic by showing up with this fun dish! Cube and boil potatoes with skins on to show your patriotic spirit. Cool completely. Add wild celery, garlic, onions and eggs and stir. In a separate bowl combine yougurt, dill, salt, pepper, vinegar, and sugar. Pour dressing over the veggie blend and mix. Sprinkle paprika on top and serve chilled. A vegan version of this recipe would use vegan mayonnaise instead of yougurt and omit the eggs. It just decided one day last week that it would be a grown up now. Cook lentils according to directions. Sautee onions in a skillet in the olive oil salt and pepper for about 5 minutes. Chop kale and add to onions and cook for an additional 5-8 minutes. This recipe seems like it may be a little bland, but the onions lend an awesome flavor to the lentils and kale. Add ins that go with this dish well are hot pepper flakes or sundried tomatoes. So what are we getting this week already? 1. 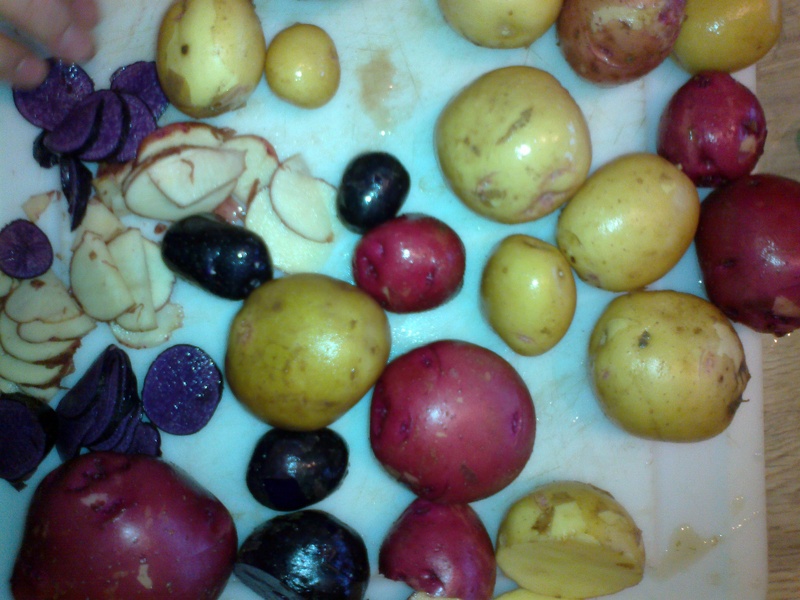 Potatoes, red, white and blue. 2. Onions- red and white. 7. Yogurt- baby pak choi for our vegan friends. Found this cool article on desireable tomato traits. Check it out!